TIME listed Greta Thunberg, a 16-year-old climate change activist, on its list of the 100 most influential people of 2019. Thunberg, who says she has Asperger syndrome, gained prominence for ditching school every Friday to protest outside Swedish parliament. The teenager warned in a high-profile speech to the United Nations last year that “we need to keep the fossil fuels in the ground” or face catastrophe. Thousands of students in Europe and the U.S. ditched school to demand government action on climate change in February. American student activists, led by the daughter of Democratic Minnesota Rep. Ilhan Omar, demanded a Green New Deal, the legislation sponsored by New York Democratic Rep. Alexandria Ocasio-Cortez. “Climate change is our reality, and youth activists like Greta are doing everything within their power to work against it, and demand a change,” González wrote. 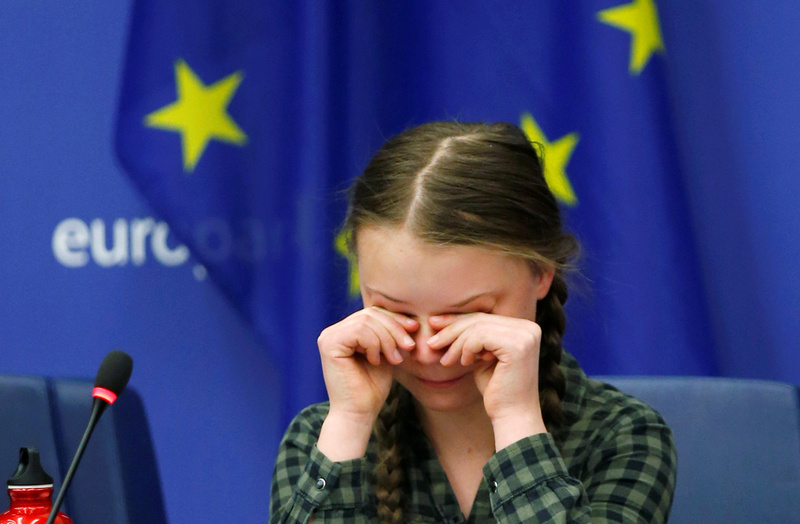 Swedish environmental activist Greta Thunberg cries at the end of her speech to the environment committee of the European Parliament in Strasbourg, April 16, 2019. REUTERS/Vincent Kessler. Environmentalists, even some climate scientists, are increasingly promoting Thunberg’s actions in an effort to draw more young people into climate activism. European politicians invited Thunberg to bring her call for urgent action on global warming to lawmakers. “I want you to act as if the house was on fire,” Thunberg said in a speech to European Parliament Tuesday. “We are in the middle of the sixth mass extinction, and the extinction rate is 10,000 times faster than what is considered normal, with up to 200 species becoming extinct every single day,” said a teary-eyed Thunberg. “Erosion of fertile topsoil, deforestation of the rainforest, toxic air pollution, loss of insects and wildlife, acidification of our oceans, these are all disastrous trends,” said Thunberg, barely able to keep her tears back.